Our driver picked us up from Ubud to head to Sanur, where we caught a ferry to Nusa Penisa island! The ferry was about an hour, its a fast boat. I’m sure you’ve heard sketchy things about transportation boats in Bali, but I promise there are safe ones. Just DO NOT get on one that looks over packed. There is a specific spot in Sanur where tons of ferry companies are located. Ask your driver to take you there, you can buy a roundtrip ticket there! When we arrived on Nusa Penida we took a taxi straight to check in at @larojabungalows ! Such an awesome spot to stay! After checking in and dropping off our bags we hired a driver for the afternoon to explore the east side of the island! We only planned two full days here so wanted to make the MOST of it! 1st stop was the Giri Putri temple -which is legit a temple inside a dark cave. You had to practically crawl through a hole to enter- so crazy! 2nd stop was the Rumah Pohon tree house (top left image)! This little wooden treehouse is perched up on the side of the mountain - makes for an awesome photo and view! Last stop was Diamond Beach!! Diamond beach is newly accessible through stairs carved in the side of a cliff and it was an unfathomable view to say the least. The trek down was very steep and some places did not have a railing and we had to repel down with rope. Took about 30 minutes to get down to the beach - We swam in the ocean at sunset, it was beautiful! And there were probably only 5 other people there! TIP: bring a pair of sneakers to Nusa Penida! There is a ton of hiking!! I was so grateful for sneakers. I honestly was in my bikini and Asics… the perfect combo. We woke up super early to take advantage of the day & to be honest, this was by far my favorite day of the entire trip! Hired our driver again for the day & he picked us up at 7:30 am so we could grab breakfast. TIP: Nusa Penida, does not have the best food options… nothing like Canggu. Obviously, because it’s a pretty secluded island. So don’t be impressed or expecting super nice trendy meals ha. We west straight to the water and got a boat with a guide to take us out to see some fish! A fresh swim in the ocean was the perfect way to wake up! The locals know the spots, so he took us around for about 2-3 hours and we just hopped from place to place. Did you know we saw a WHALE SHARK?!?!? So, get this… our guide was asking us about florida, and what the ocean is like there, and if we see sharks. We then asked if they have sharks here in bali and if he had ever seen one. He said no. No one ever does. Towards the end of our dive, were just minding our own business swimming along this coral reef drop off and all of a sudden the guide grabs my arm so hard and starts gesturing for me to look behind me. I turn around and see this massive shark approaching me… I didn’t know it was a whale shark at first!! So I literally think I might have peed and then thought to my self “I’m going to die in Bali.” As I’m thinking this, and shaking, I happen to be recording on the go pro, and of course since christian knows whale sharks are harmless he starts swimming with the thing!!! Check it out in our video. That & the monkey bite = wildest part of our entire trip. Next stop: Broken Beach & Angels Billabong - another popular spot on Nusa Penida! Not too bad of a hike, and yet again beautiful breathtaking views! These are a must. It was nearing sunset, so we jumped in the van and our driver insisted we watch the sunset from none other than “Sunset beach” - (see the photo of christian holding me in his arms on the beach). I felt like anyone that was on the island gathered there at sunset, the beach was packed with people all waiting for a God’s painting to begin. It was magical and relaxing. I can close my eyes and just picture it. What a great way to end the day. We could barley walk from the car to our room we were so exhausted. But we packed our bags so in the morning we could leave first thing, as we had to catch the 8:00 am ferry back to the main island! We searched for airbnb’s in Uluwatu and booked one that night for the next day! We hit a little thunder/rain storm on the ferry ride back to Bali, and it was just a little scary ha. But we made it safely back to Bali mainland and had a driver pick us up to take us to ULUWATU!!! If you read part ONE of our trip, you know we took a day trip to Uluwatu but our driver took us to all the wrong places. We weren’t impressed and quite honestly just frustrated since we were both sick. 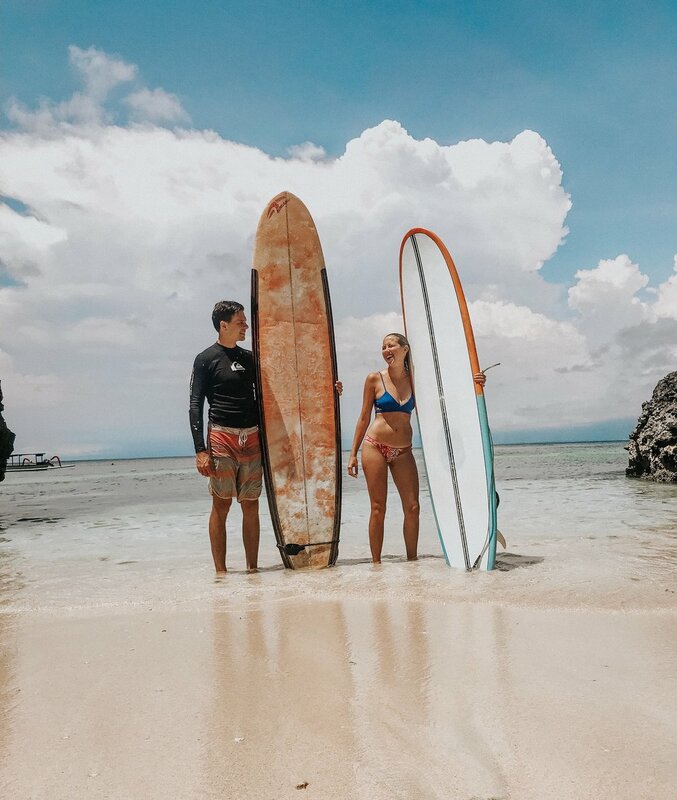 We had heard such amazing things about Uluwatu and decided we needed to actually experience the great parts of it, and of course Christian wanted to surf! We made the call to go to Uluwatu the night before ha! We had left the last 2 days of our trip OPEN (no reservations or plans anywhere shockingly) so that we could return to a favorite spot possibly or extend our stay in a certain area if we wanted to! It was nice to have this option! We arrived at our Airbnb and dropped our things & immediately rented a scooter to go grab some food at @bukitcafe. This cafe was delicious- wow! A MUST in Uluwatu! TIP: negotiate with people in bali! We negotiated our room rate and the bike rental for like $30/night!! I will say you can stay at some amazing places in Uluwatu for $100-300, but christian and I didn’t want to spend anytime in our room or at a “resort” we wanted to be riding the scooter up and down the island exploring or surfing or shopping! So we opted for a decent place & great price!!! After breakfast, we drove around the island more just exploring. Ended up at Single Fin - a restaurant overlooking the surf break and I absolutely loved the vibe. Christian went to go look for a board rental while I made myself comfy and ordered a juice! How to get to Delpi Cafe? If you start at Single fin there are stairs that zig and zag all the way down to the beach. Take them all the way down until you’re on the sand. You’ll see another stair case under a cave- take that up and go into the cafe. I think the people that run the restaurant run this private pool and will let you in ! After hours of surfing for christian and swimming for me, we headed to get massages! The best massage spot in Uluwatu by far is Laniakea Spa Bali - and make an appointment! I got one both days we were in Uluwatu hahah they are so cheap and beyond worth it. Especially if you’re surfing and hiking. Dinner at the mango tree cafe - delicious and yummy! Big portions & they had Mexican style food so it was a nice change up! Breakfast at Nalu bowls - I wasn’t THAT impressed. I definitely liked Bukit Cafe better… Eat there as much as you can ha. We then went surfing at Padang Padang beach - rented boards on the beach - super convenient ! You have to walk down through a temple to get to the beach- so cool! Took a lunch break at Outside Corner - Really cool vibe here and they play old surf competition videos projected on the wall. Went to heaven at Wanderlust next-door to try on bikinis! I hadn’t purchased ONE BIKINI in Bali yet! And I told Christian it was a must. After our surf session, we had to squeeze in seeing the Uluwatu Temple. They perform a Balinese fire dance ritual at sunset that you can attend! We didn’t get there in time, as they cap the “show” but the music is unreal! And there are monkeys all over! BE CAREFUL! These monkeys were even more intimidating than the ones we saw in Ubud! They took a woman’s flip flop right off her foot. And another ladies phone!! !